Zhang, X., and K. Caldeira, 2015: Time scales and ratios of climate forcing due to thermal versus carbon dioxide emissions from fossil fuels. Geophys. Res. Lett., 2015GL063514, doi:10.1002/2015GL063514. The Earth warms both when fossil fuel carbon is oxidized to carbon dioxide and when greenhouse effect of carbon dioxide inhibits longwave radiation from escaping to space. Various important time scales and ratios comparing these two climate forcings have not previously been quantified. 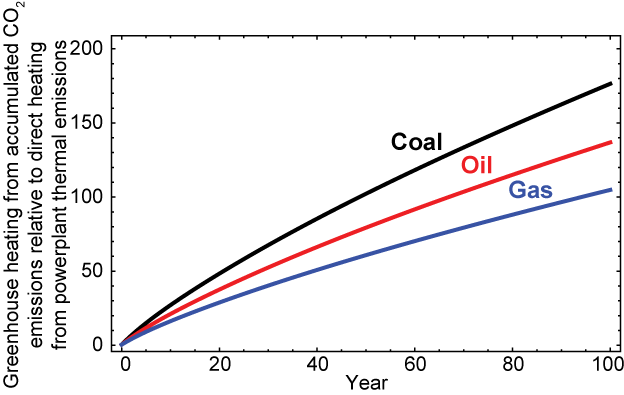 For example, the global and time-integrated radiative forcing from burning a fossil fuel exceeds the heat released upon combustion within 2 months. Over the long lifetime of CO2 in the atmosphere, the cumulative CO2-radiative forcing exceeds the amount of energy released upon combustion by a factor >100,000. For a new power plant, the radiative forcing from the accumulation of released CO2exceeds the direct thermal emissions in less than half a year. Furthermore, we show that the energy released from the combustion of fossil fuels is now about 1.71% of the radiative forcing from CO2that has accumulated in the atmosphere as a consequence of historical fossil fuel combustion. Figure 2. Results for constant continuous emissions from burning coal, oil, and gas. Table 1. Time for the integrated heating from CO2 to exceed the thermal heating from the combustion that generated CO2 for coal, oil, and gas, respectively. NOTE: It has come to our attention that in our work we regrettably failed to cite a study by Roger Sathre (http://energy.lbl.gov/staff/sathre/) which earlier and independently performed calculations similar to many of those performed in our paper. We apologize to Roger for this oversight.